Mr. Clean pilots his crispy new Di2 DRB around Elliott Circle. 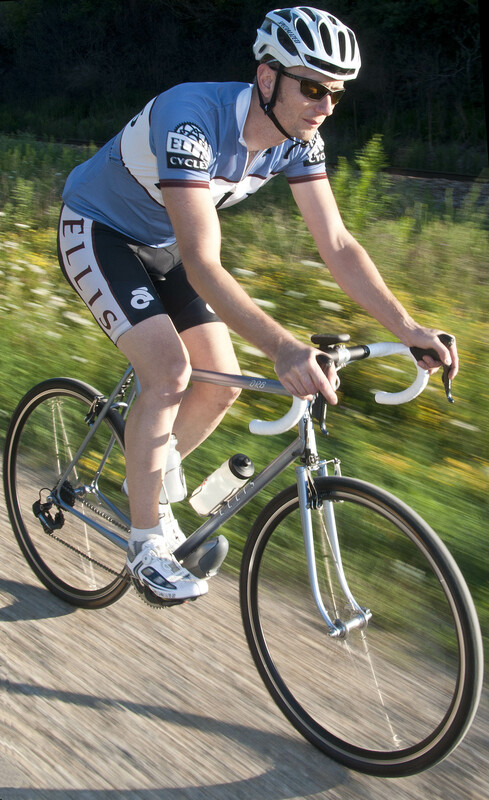 You could do no better than to talk to Dave Wages, the builder behind Ellis Cycles in Waterford, WI. Yesterday Dave stopped by my house early with his latest ride, an Ellis Di2 DRB, or Dirt Road Bike. We went for a two hour spin together down the Hank Aaron State trail to ride on some of my favorite “off piste” sections of the Menomonee Valley. I wanted to see if his Dirt Road Bike performed as good as it looked. Dave and I met when we both worked together briefly at Waterford Precision Cycles. I stayed just long enough to get dangerous with a torch. Dave came to Waterford from Serotta, already an accomplished frame builder. By the time he left Waterford to start Ellis Cycles in 2008, he was perhaps the cleanest and most meticulous builder I have ever seen. Anyway, Mr. Clean and I left my driveway around 6:30 am, and I led on a route chosen to test the DRB. We pedaled through the quiet side streets, parking lots, up and down curbs, on dirt desire line paths through parks on our way to the Menomonee Valley. Now the newest gruppo I have on a bike still only has eight cogs on the rear cassette. So as Washington Heights’ resident retro grouch, I was prepared to look down my nose at a beautifully constructed lugged road bike with some Frankenstein Di2 electronic shifting system on it. I have to admit that while I see no need for anything more advanced than Campy Nuovo Record friction shifters, that electronic Dura Ace stuff sure shifted smoothly and quietly. It was also darn ergo, as I never even noticed Dave move his hands when I saw the chain snap from one cog to another. What is it about fat tires makes a road bike look so tough? As we spun around my favorite stomping grounds, I asked Dave where he got the idea for a dirt road bike. As Mr. Old School, I love the wicked rake Dave squeezes into the bottom of his fork legs. Note the hidden fender mount. 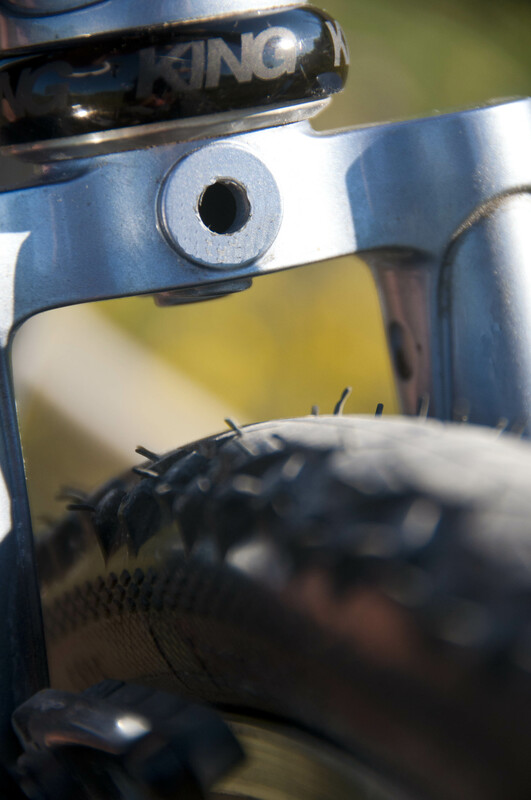 What is the difference between a DRB and a traditional cyclocross bike? 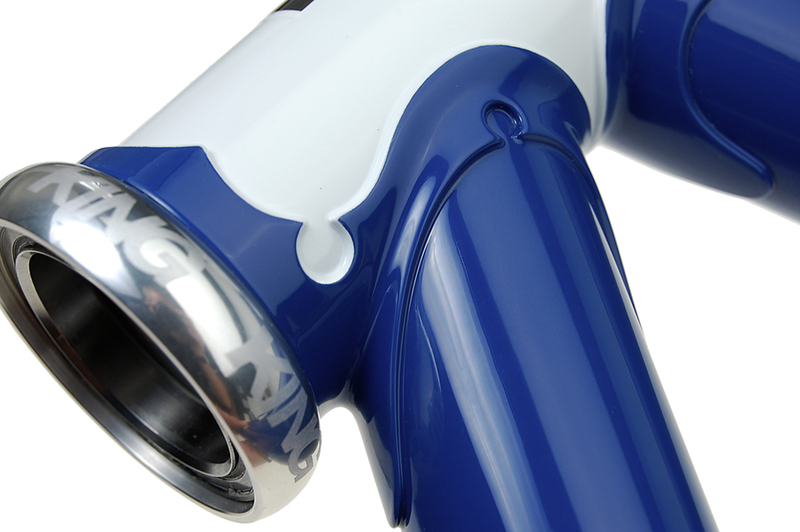 The main difference between a cross bike and the DRB is the height of the bottom bracket. 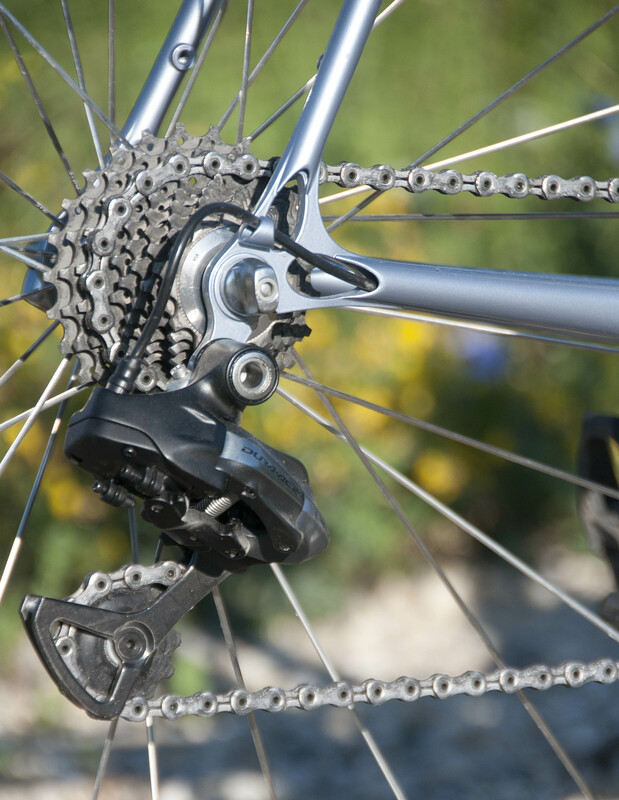 Typically, cross bikes have a high bottom bracket (60 to 70mm of drop), so you’re not hitting your pedals on rocks and roots, and don’t have to worry about clipping a pedal in the turns. The DRB on the other hand is designed much like a Grand Tour bike from the 70′s with a lower bottom bracket, longer reach brakes, plenty of room for wider tires or fenders and longer chainstays than today’s 400mm super tight carbon bikes. Other than the chainstays and fork being about 10-15mm longer for increased clearance, this bike has virtually the same geometry as my “go-fast” road bike. Parallel 73 degree head and seat angles, a 56cm ST c-c, 59.5cm top tube with 6 degrees of slope, and 80mm of bottom bracket drop, which really makes the bike super stable and comfy for long days. 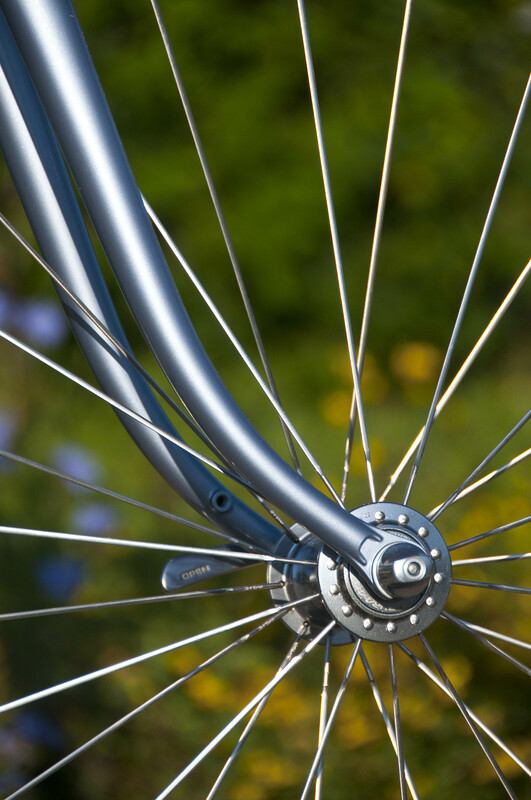 Is the DRB a popular bike with your customers? Are there other builders making them? Lots of room for fatties and fenders. There are a few other builders who have a version of this, Hampsten comes to mind, and I’m sure there are others as well. It’s not really that groundbreaking of a concept, it’s just surprising that more folks aren’t doing it! I know you can braze together a 15lb race bike if you pick some of the modern super thing steels and set your mind to it, so what sort of tubing did you use for the DRB? Jaw droppingly elegant routing for the Di2 wires to the rear derailleur. This frame, like almost every frame I build, was a combination of specific tubes from different suppliers. 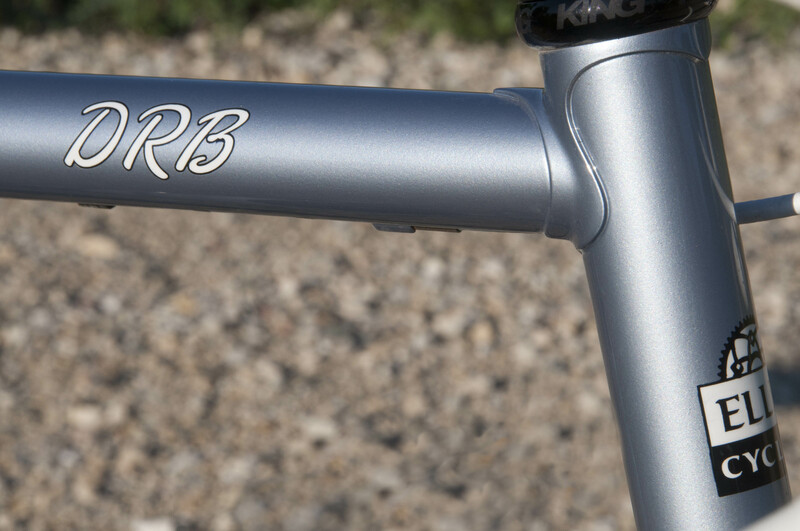 I used double oversized Reynolds 953 stainless for the top tube (31.8mm) and down tube (34.9mm). Because Reynolds can draw their 953 tubes extremely thin, (0.35mm in the middle of the tube), I can use larger diameter tubing to maintain or even add stiffness while the tubes actually weigh less than a comparably stiff oversize tube. The seat and head tube are from True Temper, their high strength S3 line, and the rear stays are from Dedacciai. The lugs are designed by Darrell Llewellyn and feature a six degree slope built into the top tube lugs, and the rear dropouts are my proprietary Ellis Cycles design. They are cut from 17/4 stainless plate, and while they may look a bit willowy, believe me, they are plenty strong! OK, you know I have to ask about that Shimano electronic gruppo. While I admit that the lack of cables make the bike look extra clean, and it did seem to shift well, why Di2 on a classic lugged steel road bike? Regarding the Di2, I’ve been impressed with this stuff ever since I built my first frame that featured it for the 2010 NAHBS (National Handbuilt Bicycle Show). I knew when I saw the first Di2 bikes that it’s performance was impressive, but the integration of the parts on those early bikes left a lot to be desired. I knew that I could route the wiring and integrate the parts far better on a Di2 dedicated custom frame, and that was my mission on that first Di2 frame. It got quite a bit of attention at NAHBS that year, and I dare say it’s been copied a fair bit by other builders as well! 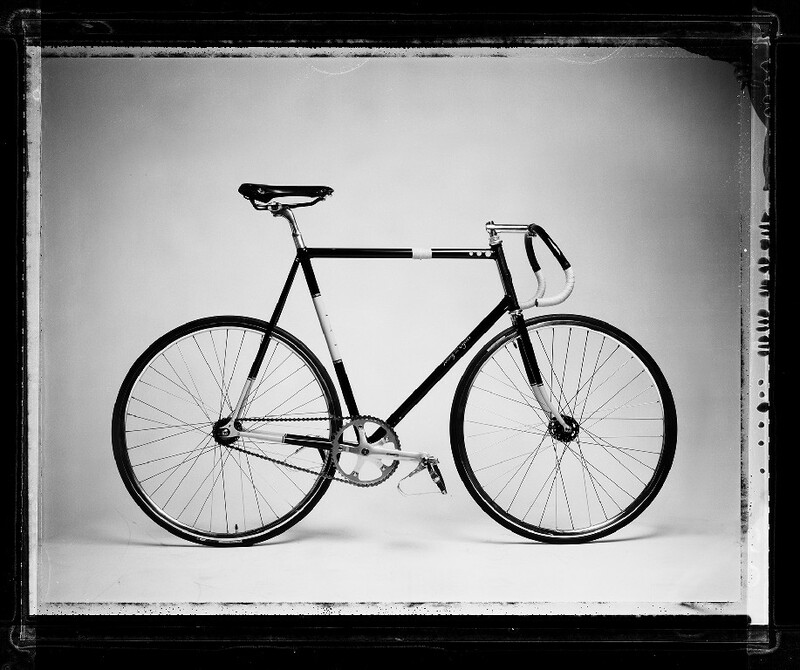 Maybe the perfect road bike? Here I have to but in, because Dave is being far to modest. Ellis Cycles has walked away with the top awards at the shows for custom-built bicycles for the last three years running. 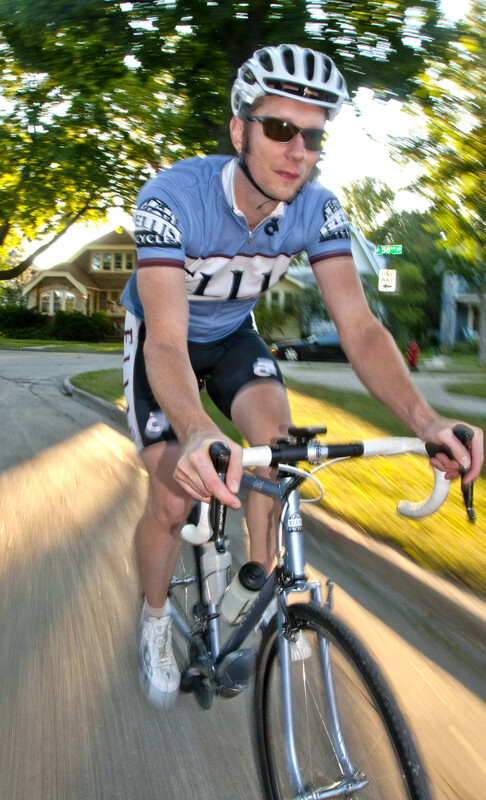 At the 2008 Cirque du Cyclisime, one of the first Ellis frames won “Best Track Bike”, and later that same year, Team Ellis rider Jame Lalonde won the Cyclocross Single-Speed National Championships (read about his victory). Not bad for the first year of his business. 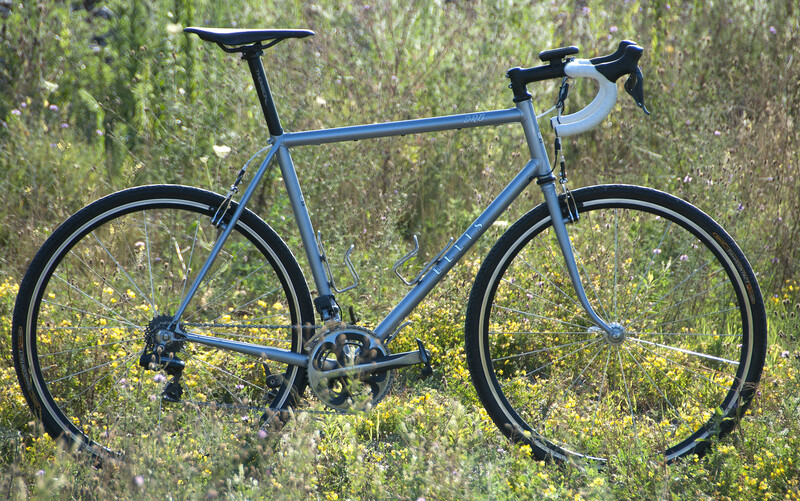 Not one to rest on his laurels, the very next year Dave followed at the 2009 Handbuilt Bicycle Show, a polished, 953 (a modern stainless steel) Ellis was awarded “Best Lugged Bike” – quite an honor considering the collection of talent there. 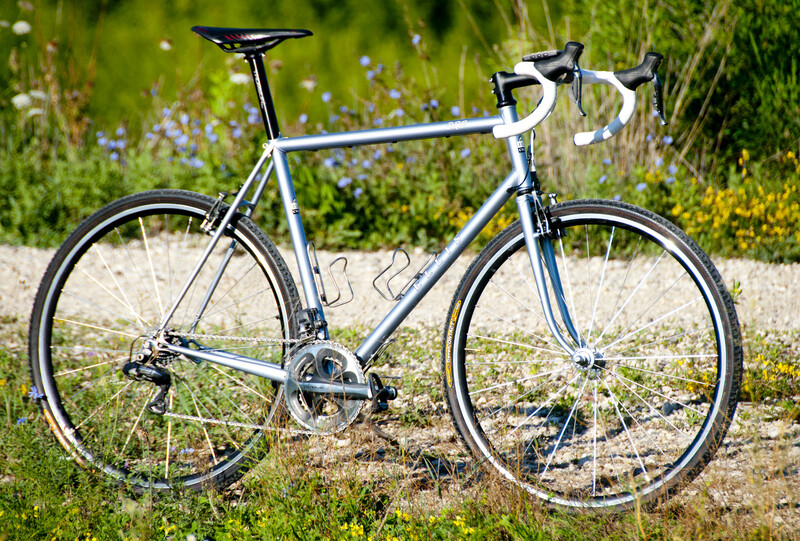 You can read a review of his shiny stainless beauty in Road Bike Action (read the positive review of the “Modern Classic”). It cannot go without mention that while Dave certainly gets huge props for his skill with a file (Dave builds with hand tools), a torch, and a bit of silver, he does have a secret weapon in his painter, Jason Sanchez. Jason, of Sanchez Paint Shop, is responsible for laying down the gorgeous gloss on all of Dave’s award-winning bikes. Jason’s paint jobs have graced NAHBS award-winning bikes built by other builders, including Jon Kendziera of Jonnycycles, another Wisconsin builder. Jason is another local hero of mine, and I’m proud to say his shop is in my neighborhood in Milwaukee’s fashionable Washington Heights (West Side is the best side!). Dave kicking it on the gravel. So what is next for Dave and the DRB? This weekend I’m headed out to Dodgeville for the 150K route at the Dairyland Dare. With 10,000+ feet of climbing, it’ll be quite a challenge. A couple of weeks after that, (Aug. 28th) I’m heading out to Deerfield, MA, for D2R2. It’s also got plenty of climbing, but the added challenge being that most of them are on dirt roads. Should be a good test for the DRB! Good luck with those hills Dave. Dirt road racing is definitely a growing sport that combines a bit of competition with a lot of fun. I think I may pop some skinny knobbies on my Waterford-built All Rounder and sign myself up for one soon. Anyone have a suggestion for a dirt road race to try? The Almonzo 100? Mark and Tina want to put something on the calendar and road trip together? If I could only keep on bike this would be it. A true all-rounder modeled after the venerable Bridgestone XoO1. The bike is built up as a commuter in this photo. 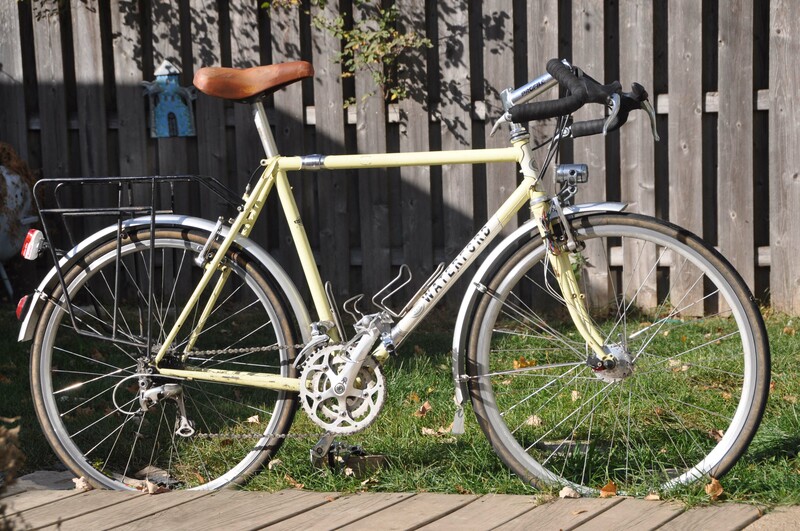 With Roadish geometry, a Rivendell fork crown and room for 26 inch mtb tires, I can go anywhere on this bike. It has been well used over the years, ridden hard and put away wet. The color is Pale Primrose, which is a vintage Jaguar color. I’m proud that I can say with some authority, if you want to buy the best bespoke steel bicycle in the world, you can get it in Wisconsin, and you need look no further than the team of Ellis Cycles and Sanchez Paintshop. Great post. Dave sure makes some beautiful and thoughtful bikes. Did you happen to notice where he put the Di2 battery? As best I can tell, it’s on the left chainstay, just behind the BB. My Gunnar Sport has a similar build. 80mm BB drop, clearance for 32mm knobbies, and road-ish geometry. It’s a really fun bike. I suspect that style will increase in popularity as people become more aware of it. Hey Denny, regarding the battery mount, you’re right, I locate this on the bottom of the non-drive side chainstay just behind the bottom bracket. I know other folks are putting them in the seat post and under the seat, but I’m a fan of keeping that little bit of extra weight low on the bike and easily accessible.